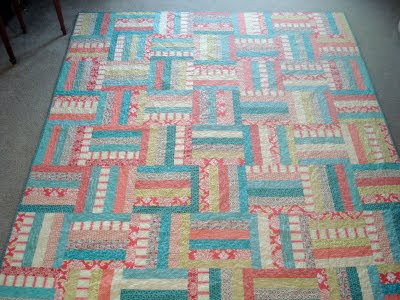 I finally finished my quilt for the Old Red Barn Co. Quilt Along. Well, it was finished about a month ago, but I haven't had the time (or the space) to photograph it. This baby is a big one - my biggest quilt yet. It was meant to be used in the guest bedroom, but I think I'll be using it (and loving it!) in my room for awhile. Who cares if it doesn't match, right? 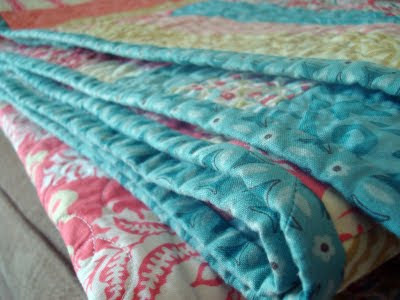 I haven't done much strip quilting in the past, and I have to say that I'm not a fan. It is nice and fast, but I found myself a little bored toward the end of the piecing process. Here's a view of the back, which is my favorite part of this quilt. I could no longer find the fabric that I wanted to use for the binding, so I used my second choice - this happy blue with triangles. When I was still in the piecing phase, I began to be a little concerned about how I would ever manage to quilt this on my little workhorse of a sewing machine. Then I saw this flier at Broadbents and decided to give it a try. I am so glad I did! Kristin is so nice (and very patient!) 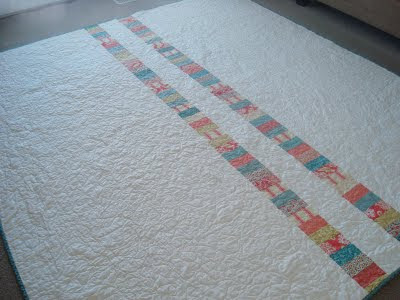 and it was a treat to get to use a long arm quilter. Thanks Kristin! Yours turned out beautiful! I felt the same way about all that strip piecing... I received your scrappy christmas blocks yesterday! Love them, thanks! Just figured out you have a blog....! Thanks Wendy! I'm looking forward to seeing everyone's finished scrappy Christmas projects. What is the dimension of your cuts? 2x8 or so? It's very pretty.